Goody bags now worth €150!!! to include bubbles on arrival, tapas, wine, fashion show, make-up & hair demonstrations and Q & A chat with Ireland’s top skincare professionals – Dr. Garrett Brady Ireland’s leading facial aesthetic surgeon, at Lowell Medical Clinic and Peggy Stringer, Skincare expert at Monkstown Laser Skin Clinic. I’ll also introduce you to the best treatments in town and talk to an expert on ‘How to be your best shape’ with one ‘miracle’ piece of clothing. There will be free draws worth €1,650 and 2 spot prizes worth €100 each. 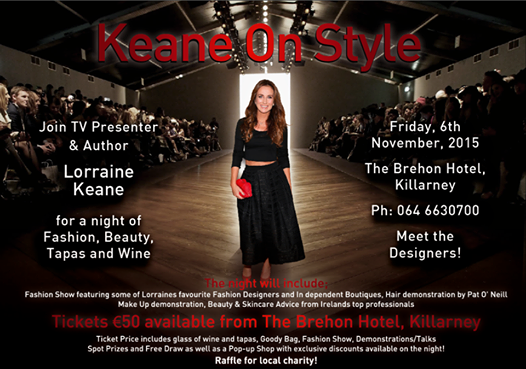 Call The Brehon Hotel to reserve your seat! Hello From The Malton Killarney!